Bhutan Time is 6 hours ahead of GMT. Currently in Bhutan, the time is 1:55:16 PM on Monday, April 22, 2019. 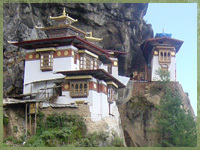 Bhutan's climate varies significantly with altitude and between specific locations. There are three broad climatic zones: subtropical in the south, temperate in the broad central regions and alpine in the north. Rain is concentrated in the monsoon season from June to September. The national language is Dzongkha. English is widely spoken in major towns and is a medium of education in schools. Other widely spoken languages are Nepali, Bumthap, Sharchop and Hindi. There are a host of local dialects spoken in small pockets within the country. The unit of currency is the ngultrum (Nu), which is equivalent to one Indian Rupee. The Indian rupee is also legal tender. Major convertible currencies and travelers' cheques can be exchanged at banks in all major towns. Certain credit cards (Mastercard, Visa, & American Express) are accepted at a few large hotels and shops. Traditional Bhutanese cuisine is very rich and renowned for the plentiful use of chilies. The most popular dish, ema datsi, is comprised of chilies (used as a vegetable) in a cheese sauce. Hotels and restaurants generally serve Indian, Chinese, Continental and Bhutanese food. It is safer to only drink mineral or boiled and filtered water. A reasonable variety of both hard and soft drinks are available in hotels, restaurants and shops in most towns. Many Bhutanese enjoy drinking traditional homemade alcoholic brews made from wheat, millet or rice. The standard of accommodation remains relatively basic, particularly away from the major western towns. Most places are simple but clean, and service is slow but friendly. All towns in western Bhutan have a reliable power supply. Elsewhere, access is less consistent, and electricity is not available in most outlying areas of the country. The voltage supply is 220/240, the same as India. The main health risks are similar to other South Asian countries, namely diarrhea, respiratory infection or more unusual tropical infection. It is wise to have health insurance, and although vaccinations are not required they are recommended. When trekking there are also risks associated with altitude sickness and accident. In the event of health problems there are basic hospital facilities in each district headquarters. The crime rate is currently extremely low, making Bhutan one of the safer places in the world. It is rare to feel at all insecure within the country. All major towns have basic communication facilities, including post, telephone, fax and telegraph. Television and internet were introduced in 1999, and can be accessed in major western centers. The most popular tourist purchases are traditional Bhutanese arts and handicrafts. Produced by skilled artisans, these are generally of a high quality, and include Buddhist paintings and statues, textiles, jewelry and wooden bowls and carvings. Bhutan is not a consumer society, and the variety of everyday goods available is not particularly large.